WARNING: this page has a heap of pictures please wait while they all load! We do not sale KITS !!! Each project is different so if you purchase a kit from a company you may not have enough cable or you will have to much and it is wasted money! Please call with your specifications and we will correctly set you up with the right cable and Light unit to get the job done! Fiber Optic Landscape Lighting is becoming the most beautiful lighting addition to yards around the world! We carry all sorts of Fixtures for your Ponds, Spas, Pools, Decks, Waterfalls, Shrubs, Trees, and More! No one item is specifically made for Landscapes except the Pool and Spa sections so here we present a few color ideas for lighting. 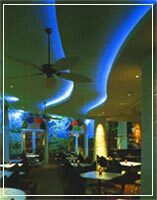 Please call in your design project so our expert team of fiber lighting designers can best set you up with the right cable, fixtures, and light unit. With the use of our Stranded or Solid Sideglow cable, you get color changing effects, No Heat, No Electricity Dangers, and a Rich exotic look. 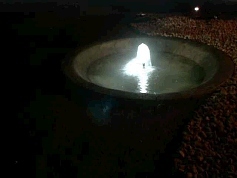 Additional Light was used for deeper in the pool, but main accenting lines are color changing and beautiful. but Sideglow cable will provide a glow beyond your dreams! 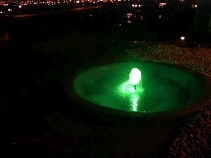 Your Water Fountain will change colors like no others on your block! 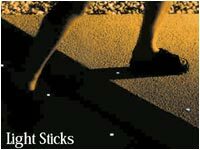 Our Light Sticks are a wonderful addition to your walkways, simply Hammer in Stick, run our EG12 or EG25 Endglow cable underground to the Light Stick, insert, run other end of cable to Light unit. We recommend the FOP150 for longer runs of over 30 ft, if under then our FOP32 or FOP75 will do! Switch unit on and watch the glow! You can cut Sticks flush to ground or Leave above. 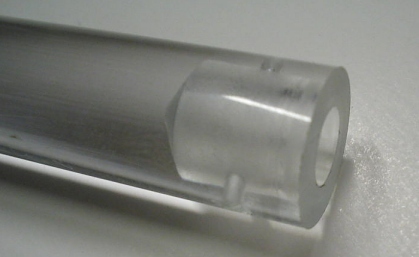 Fully machined, Not cast like other. Made in America ! 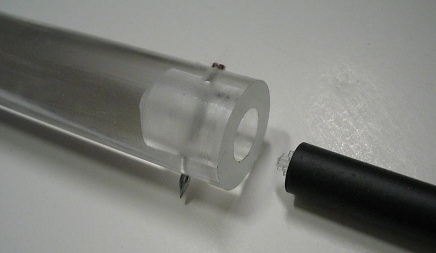 Stick are made from Clear Acrylic rod. They come in 4.5" or 2" long x 1/2" Wide. Installing Endglow cable into Light Stick s simple, just insert cable into stick, push thru the pin to hold cable and place stick where you wish. Run other end of cable to light unit and your done! Prices drop with quantity order, we will discount when card is run. For safety and beauty add some Sideglow cable lighting to your Boat Dock. We recommend our FOPH-100 Halogen unit for smaller runs (10-50 ft) and the FOP-150 Metal Halide for the longer runs over 80 ft. The cable to use is our SG35 or SG500. Stranded Sideglow depending on run. Track or P-Clip for holding cable to Dock. An average cost for Dock Lighting will be around $800 and up depending on runs. Spa Lighting is fun and easy with our help! We recommend our FOP 75 Watt for Spa lighting. Use the SG32, or SG50 Sideglow cable and Tracking. Please call for information on installation!